By Stephanie Lam • All photos by Stephanie Lam. 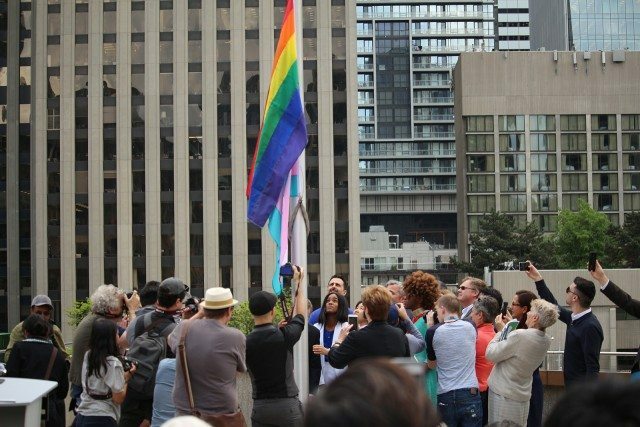 The annual Pride flag raising at City Hall on May 31 marks the start of Pride Month in Toronto, with plenty of celebrations to come. Councillor Kristyn Wong-Tam (Ward 27, Toronto Centre-Rosedale) emceed the event. 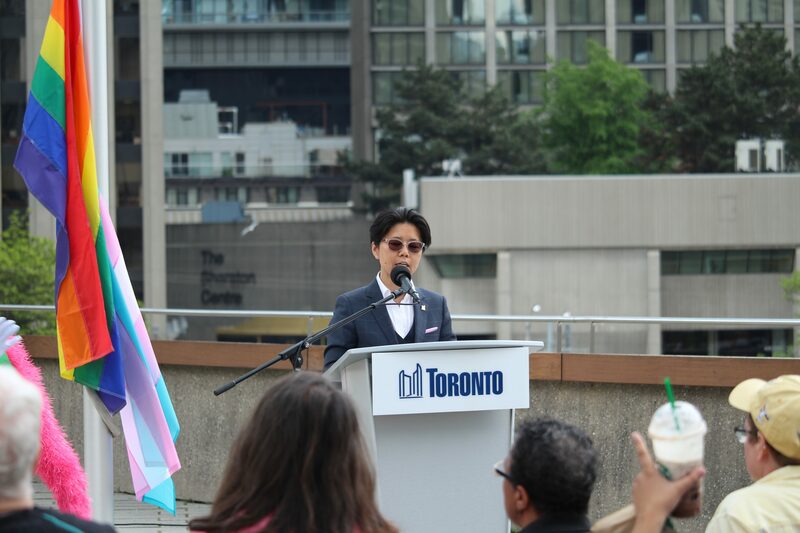 “Toronto’s queer community is the most complex and intersectional of any community, and that’s why Toronto’s intersectional hyper-diversity is not only a challenge, but also our greatest strength and asset,” Wong-Tam said. 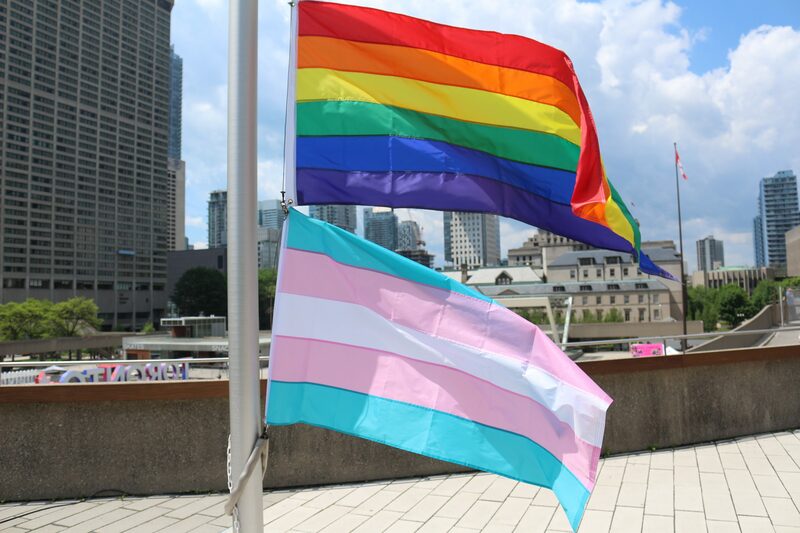 The City raised both the rainbow Pride flag and the transgender pride flag this year. Pride Toronto co-chair Alicia Hall noted that trans rights have been a topic of discussion across the country recently. “Trans rights in the form Bill C-16 are poised to become Canadian law, an achievement that wouldn’t have been possible without the advocacy of community leaders,” Hall said. 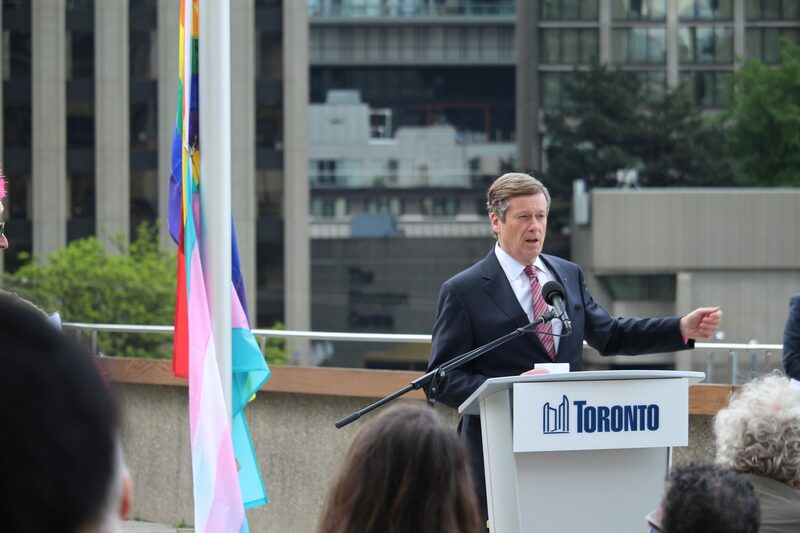 Mayor John Tory spoke at the event to kick off the 37th annual Pride celebrations. “Toronto stands firm in condemning all acts of discrimination and violence towards the LGBTQ2S [community],” he said. 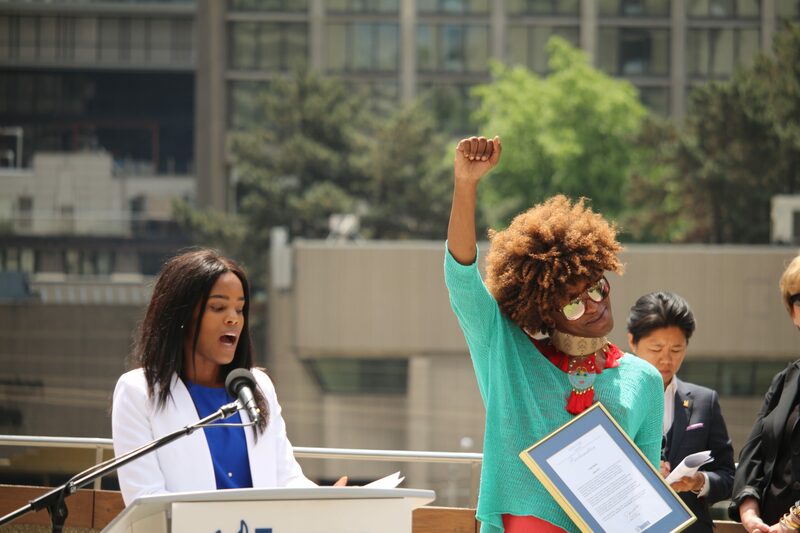 Mayor Tory presented Hall with a framed copy of the declaration of Pride Month, held here by Biko Beauttah of the Pride Toronto board of directors. Hall spoke about the visibility and fun that Pride offers. “For the next 25 days we will take over this city, there will be rainbow flags, trans flags, [and] glitter everywhere,” she said. Check out some more photos of the event in the gallery below. Sister Twisted Fister of the Holey Christ Co. was representing The Toronto Sisters of the Jubilant Order of York (JOY) which is an official mission of The Sisters of Perpetual Indulgence, which was founded in 1979 in San Francisco. The sisters describe themselves as an order of queer nuns who take vows to "promulgate universal joy and expiate stigmatic guilt." Photo by Stephanie Lam. Sister Twisted Fister of the Holey Christ Co. was representing The Toronto Sisters of the Jubilant Order of York (JOY) which is an official mission of The Sisters of Perpetual Indulgence, which was founded in 1979 in San Francisco. The sisters describe themselves as an order of queer nuns who take vows to “promulgate universal joy and expiate stigmatic guilt.” Photo by Stephanie Lam. Mayor Tory presents Pride Toronto co-chair Alicia Hall with the declaration of Pride Month. Photo by Stephanie Lam. Pride Toronto stands under the Pride and transgender pride flags at City Hall. Photo by Stephanie Lam.